Termites are a serious problem here in Coffs Harbour, and you need to protect the biggest investment you may ever make - your house. Termites may already be in your home, in which case you need to act now before they cause severe structural damage that's very expensive to repair. There are quite a few cases where homeowners have had to walk away from their homes because termite damage has been so extensive. It's far better to stop termites before they come to dinner. Put simply, termites eat wood and they come to your home looking for food. They get there by travelling through the ground from a nest that may be hundreds of metres away, and then they build mud tunnels into your house. They can squeeze through cracks the thickness of a piece of paper. Homeowners don't usually know they're there until substantial damage is already done. They eat anything made from wood inside your home, and even gyprock and plasterboard walls, leaving a paper-thin layer of paint. Unfortunately by this time termites are right through your home no matter how your house is constructed. Even steel-framed houses are not immune to termite attack, The termites can still get in and destroy roof trusses, furniture and wood-trim such as architraves. In fact anything made of wood. A termite inspection will involve a thorough examination of interior walls, skirtings and other wooden fixtures. The roof void should be fully accessed and meticulously inspected. If there is an underfloor, this area will also need to be termite inspected. The outside of the home, including outbuildings, fences, retaining walls, trees and stumps will also be inspected for the evidence of termites. The left and the right image are of the same section of roof in a building, where the light fell down, revealing termite mudding and active termites. The yellow spots on the thermal image is major termite activity. Should active termites be found during the termite inspection, we will then provide suitable options for a termite treatment. These options can be varied to suit your budget. The decision as to which will be the most suitable initial treatment will depend on the time of the year and the weather conditions at the time in Coffs Harbour. Baiting active termites with Nemesis Termite Bait, is a viable option to eliminate them from the home and kill the offending nest. 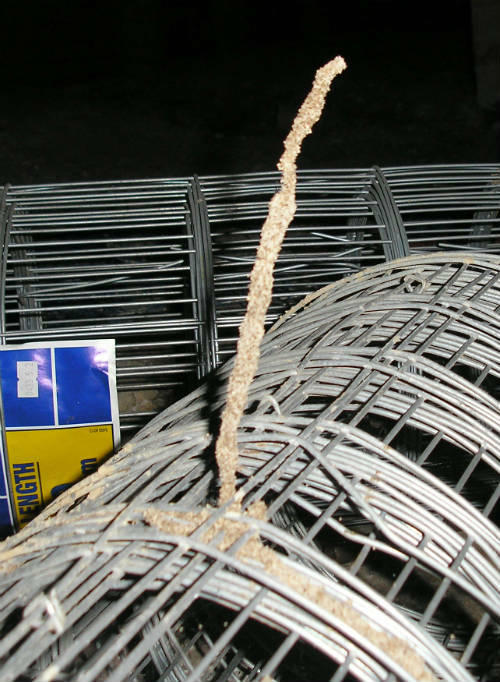 The bait will be presented in an above-ground bait station attached to an area of termite activity. Once termite treatment has been completed, a suitable termite barrier can be installed to prevent reinfestation. When you find termites in your house, don't disturb them or spray them with fly spray as this will make a treatment of active termites much harder.